Each year on March 17th, we Hobbits celebrate Bullroarer Took Day! And we commemorate those who have fallen in the Battle of the Greenfields in S.R. 1147. We all know that that Battle was almost lost, had it not been for Hobbit chieftain Bandobras "Bullroarer" Took, who came and decided the battle with a single blow of his big club. Reason enough to celebrate this hero's deeds every year. There are many customs surrounding Bullroarer Took Day: Fence running, heavy drinking, lots of music and dancing and the Wearing of the Green. 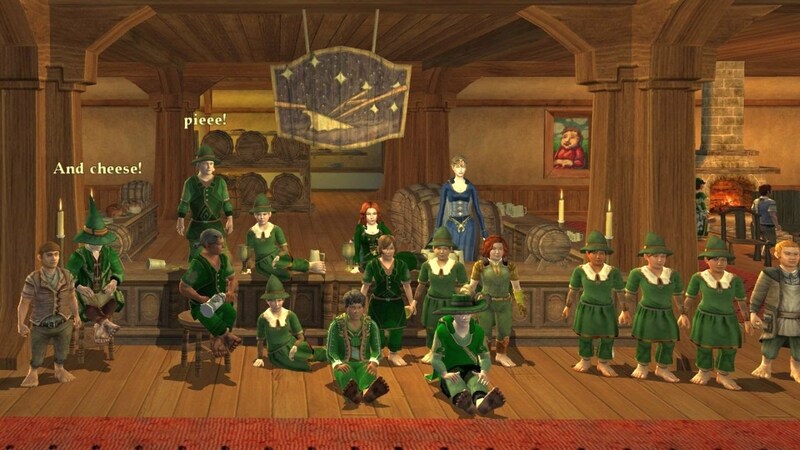 We hope all who come to the celebrations put on a green costume for the occasion. This year's celebrations are organised in close cooperation with the Bird and Baby Yard Party Staff and several volunteers. Where: We gather at the Bird & Baby Yard, from there we take the pony to Brockenborings via Hobbiton. When: March 17, 19:30 ((UK and 15:30 servertime!)) at the Bird and Baby, 20:00 ((UK and 16:00 servertime)) in Brockenborings. We all face the statue and drink to the victory and the fallen. The Greenbrambles have been with us on Bullroarer Took Day for many a year now. They will bring songs and dances in a fashion that is closely knit with this special day. Poets who have answered the call to write poems dedicated to Bullroarer and the Battle of the Greenfields, will now perform them for you. We ask you all to join us in a not to be taken too seriously re-enactment of the battle. Please, read the rules that can be found below carefully and pay attention to the group guide's words. Having arrived in the Shire just recently, the Little Wanderers have already enrichened our lives with a weekly event: The Night of the Muses. To show our gratitude and make them feel even more welcome in our part of Middle-Earth, we cordially invited them to be the second band to play for you tonight. Still not battle-weary and eager to hear or play more music? Then the Open Stage is just the thing for you. There will likely be no host to announce the performers, so we ask you to take the initiative yourself. Keep in mind, that there will be more performers wanting to play, so don't make your set too long in such case. Note: We are not going for historically correct, we are aiming for fun! We ask you to come dressed in green, as is tradition on Bullroarer Took day. But we also ask you to bring a non-green and non-red outfit. This can even be your combat outfit, providing ofcourse that that is not green or red! If you have a goblin mask (or any other mask) in your vault, please bring that too, slotted in your non-green outfit. At the Bird and Baby, offer to share masks with others who can then put it in their Wardrobe and give it back to you. Also bring any snowballs, rotten fruit, D.R.A.G.O.N., batswarms and such. You'll need them! But remember that we need to be in Brockenborings strictly at eight bells! The group leaves the Bird and Baby at 19:45. At the start of the re-enactment the two group guides announce themselves. They will be dressed in red. They will briefly explain these rules again. You will be asked to enable involuntary emotes for the duration of the Battle. You will then be split into two groups of about equal size and each group will be linked to a group guide. Now then, a roll of the dice will decide which group are the goblins and which group are the hobbits. The goblin group will don their masks and non-green outfits. And we are ready to rumble at the signal of one of the group guides! As soon as the signal is given, you can target a member of the opposite group and attack. You can use everything that is at your disposal: weapon skills, class skills, snowballs, rotten fruit, batswarms, D.R.A.G.O.N., and beside your regular weapon: frying pans, rolling pins, egg baskets, bagpipes, pitch forks, handbags and so on. We originally based the battle mechanics on sparring, but Bounder Primstone of Brockenborings did not give us a permit to do so ((the Shire is a non-sparring zone, apparently)). So you can instead taunt, slap, fishslap, roar, charge, challenge or anything else you can think of and ofcourse throw projectiles or try to have an entire platoon faint, cheer or dance on command. Use bagpipes and/or drums to inject fear in your opponents. Let those creative juices flow freely! The battle comes to a halt when a truce is called. Please stop all attacks on your opponents, but you can still taunt them verbally ofcourse. Now watch what happens next..